designed and commissioned by our respective Clients. Take a photographic tour of SOME OF Hall Madden's most popular Fabric Collections. FABRIC: Loro Piana "Summertime" wool-silk-linen blend (71-15-14). 250gr weight with slubby texture and great light reflection with a tonal blue plaid. DESIGN: Two-button notch front with flap pockets and dual vents. Interior with silver grey Japanese bemberg lining and contrast piping pattern. Burnished blue buttons (5 on sleeve) with contrast stitching for buttonholes. The perfect blue blazer for summer without being boring. A lighter blue shade mixed with a subtle pattern ensures the client has a unique sport coat that doesn't get lost in a room full of dark navy jackets. This blazer can be used for both business casual and events and has a seasonal texture that is both soft, light and breathable. FABRIC: Loro Piana "Superfine" Super 130s jacketing. 260gr weight in grey-taupe plaid with blue overcheck pattern. DESIGN: Classic business casual jacket layout with two-button closure and notch lapels. Dual-vented back with flapped pockets -- and in a unique twist, a flapped ticket pocket as well. For business casual outfits, selecting a grey-toned blazer can be difficult. This is why a patterned fabric with blue color was selected to more easily pair with solid grey trousers in all shades (dove, oxford and charcoal grey). The blue in the plaid also allows a variety of blue shirts (solid, striped and small checks) to be worn with ease, making this blazer a versatile player in the wardrobe. FABRIC: Solbiati "Nobel Lino" in 270gr weight. Boldly patterned rust red plaid with grey and blue overchecks. DESIGN: Two-button front with notch lapels and rounded patch front pockets. 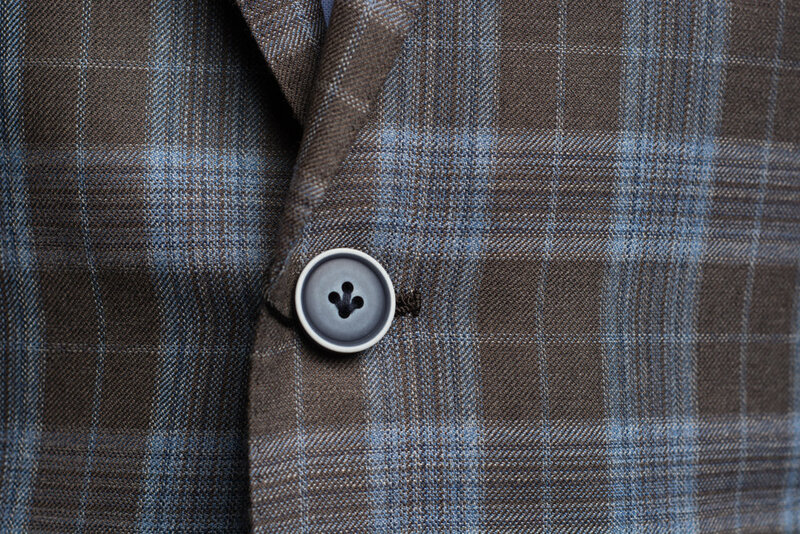 Contrast stitched buttonholes and dark horn buttons. Selected with unabashed boldness in mind to take on the summer heat, this linen blazer is more densely woven to provide a better drape than lighter and flimsier linens that reduces wrinkling -- instead, it "rumples" as good linen should. Perfect for weekends out and wears well with chinos of all shades and can be dressed up with navy trousers. FABRIC: Ermenegildo Zegna Summer Cotton mesh. 240gr weight in royal navy blue open weave. DESIGN: This jacket is made for maximum comfort. In a superlight cotton weave that allows for airflow and softness, this new fabric from Zegna also works well here as an unstructured blazer -- meaning no shoulder pads and no interior canvasing. This blazer's soft construction apprears more relaxed than rigid and formal. It also can be made with trousers to make a full suit that's perfect for the summer. You can wear it simply as we've styled it here, or use the brighter navy tone as a background to your bolder and more cheerful summer checked shirts. Paired with chinos and a multi-colored gingham, we think it's a go-to choice for the warmer months. FABRIC: Lanifico Di Pray Summer Hopsack in grey. 280gr weight with an airy, open weave. DESIGN: Two-button closure with notch lapels and dual vents. Patch rounded pockets and grey resin buttons with rust burnishing. The goal for this jacket was a go-to piece to be worn with denim of all shades. The textured weave of hopsack leaves no doubt this is a blazer, not an orphaned suit jacket. Patch pockets make it more casual and the light grey color allows it to be easily worn with almost any color or pattern shirt. FABRIC: Lanifico Di Pray Summer jacketing collection. 230gr weight wool in taupe brown and Carolina blue plaid. DESIGN: Standard two-button closure with notch lapels and dual vents. Flap pockets and five-button sleeves with contrast stitching and slate blue buttons. If you plan to wear your blazer without a necktie, it's sometimes a good idea to have a pronounced pattern in your jacket to keep your outfit from being too bland. Despite being a bold pattern, this blazer is easy to wear with almost any blue shirt and over jeans, navy trousers or darker grey shades.